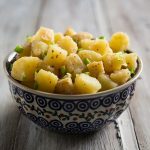 With St. Patrick’s Day just around the corner, tonight I couldn’t resist making one more Irish-themed recipe. I had a bunch of kale in the fridge that I needed to use up, so my thoughts immediately went to colcannon, the traditional Irish dish of mashed potatoes and cabbage or kale. Then a conversation about potato pancakes got me thinking of the ones my mother used to make with leftover potatoes, and soon I was contemplating colcannon pancakes. Sometime between cooking the potatoes and adding the seasonings I decided to try baking the colcannon in small balls. My theory was that my daughter would be more likely to eat a small green ball than a large green patty, a theory that was validated when she saw the potato-kale mixture and declared that I had just ruined a perfectly good batch of mashed potatoes. Fortunately, she was still willing to give the cooked puffs a try, and after eating all three of the ones on her plate, she announced that they were better than they looked. I’ll take that as a compliment. 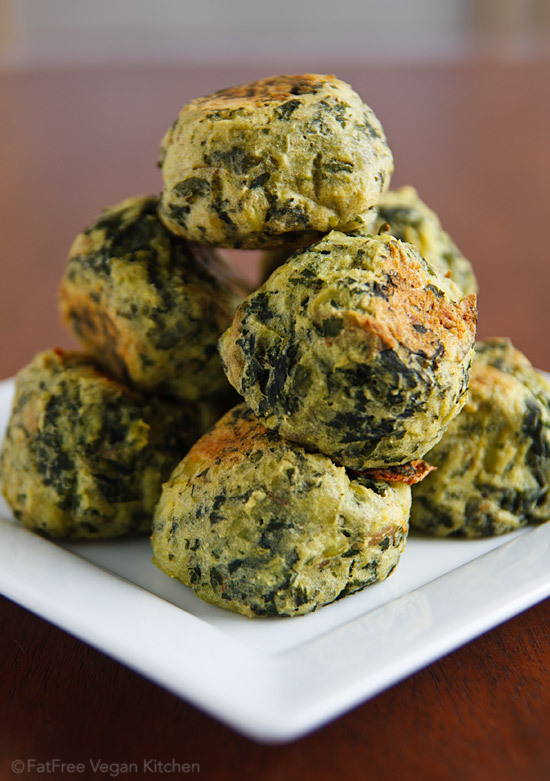 Tender on the inside, lightly crispy on the outside, these deliciously seasoned puffs may have your kids eating kale, too! To save time, you can also form these into larger patties and pan-fry in a non-stick skillet. Nutritional data includes 2 tsp. salt. Use less to reduce sodium. 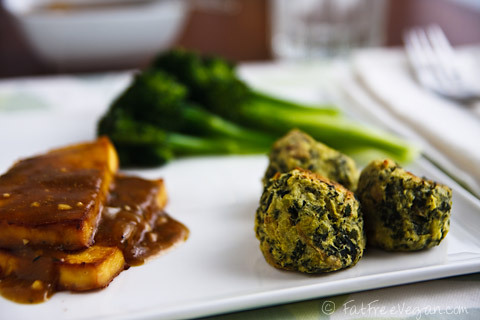 I served the vegan colcannon puffs with baked tofu with a basic gravy and broccoli. The puffs tasted delicious with a little gravy, too. Do you think I could make these ahead of time…like a 12 hours to a day? and store it in the fridge? Alyssa, these should be fine if made ahead. Enjoy! Hmmm….I tried to make these last night and something didn't work! I used yukon gold taters and must have mashed them a little too much – my kale/potato mixture was really wet. I decided to make patties and fry them – and then the turned into oily green potato chip looking things! Oh well, live and learn! I wish more people would come and review the dishes you make after they try them…so that we can get tips and tricks that will help us in cooking. For this one it was very wet and just a word of advise for anyone the extra water that gets mixed in with the potatoes and the kale will be plenty if not too much water, don't add more water until after you have mixed everything together, if it is even needed. I also think this may have been better cooked at 350 for 23 minutes or so cause the outside was cooked but the middle was like a mashed potato. overall they were great and I do appreciate your blog so much it really helps me, so I hope none of this is taken as the wrong way. First, let me extend my compliments to your website!! I really enjoy reading your articles and flipping through your intriguing and delicious looking recipes. I have many saved, ready to try. I tried this recipe and they turned out very different than the recipe here. They turned out hollow…like true “puffs”….they were really good and the flavor was delicious. I agree to leave out the water. I think mine turned out hollow and puffy because I mixed the potatoes in my kitchenaid (with the whipping attachment) with the kale (which blended the kale up with the potatoes nicely) since my food processor has recently given up the ghost. 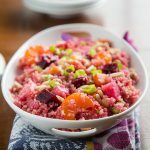 I will be trying many more of your recipes and leaving feedback on them. Thanks for such a great resource. Absolutely wonderful! I don’t have nutritional yeast but this was magnificent without! Even my carnirvore husband loved them and asked for me to make a huge batch and freeze them just to have on hand! Thank you so much for such a wonderful recipe! Made this tonight to kick off our “Irish Week” celebration! Was a HUGE hit with my mostly non-vegan family, and I will definitely make this again. I agree with a comment below – I’d wait to add extra water. I think the cooked kale held a little water, and the puffs didn’t end up being as puffy as possible. Still AMAZING! My step-dad loved these with mustard and hot sauce, but then again, he likes everything with mustard and hot sauce. 🙂 Thank you!!! Yum! I just made these. I used half a pound of frozen chopped kale (thrown in with the potatoes for the last minute of their cooking) and did not add any of the potato cooking water (since the kale was already chopped) and they were great. Thanks Susan for another winner! Thank you so much for this recipe!! I am absolutely without a doubt going to make these. Mmm mmm mmm! Mine weren’t super puffy (probably because I’m baking at a high altitude! ), but they were still delicious. Next time I would probably cut down on the salt. I did the 2 tsp rather than “to taste” and I think next time I would cut down to even 1 tsp. 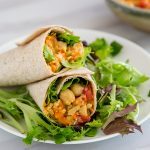 They are still really good and a great idea for a side to pack for lunch during the week. I made about 30 of them to bring with me and I’m really looking forward to them! As for the moistness that everyone is commenting on, I did not have a problem, but I probably did not add 1/4 of the cooking water to the kale in the food processor. I maybe added a little more than 2 T. eyeballing? I felt like my potatoes were mushy enough. Thank you so much for sharing all of your delicious recipes! This one definitely got the kids eating some kale! The whole family loved them!! Just made these and they turned out great! Next time I’ll probably use half the salt. I used the full recommended amount of water and it worked. I really made sure there wasn’t excess water when I removed the kale and potatoes from the pot tho. I cant wait to make these into patties for a brunch one of these days. Making these for dinner tonight and I can tell we will all love them! Sounds great! Too bad my little guy wants nothing to do with mashed potatoes! I’d love your recipe for Baked Tofu! Here’s the baked tofu recipe, Kat: http://fatfreevegan.com/blog/2010/02/25/baked-tofu/ It’s super-easy! These bad boys are awesome! Thank You so much! Looks amazing! I’ll definitely be trying it soon (Tonight if possible)! I might try two batches, one with kale and one with spinach. Would frozen kale work? Or should I wait until I have fresh kale on hand? Just tried these (and burnt my mouth eating them when they were still too hot!). I’m glad I looked through the comments as I didn’t add any of the cooking water and they are still quite wet. Regardless, they are utterly delicious (I used fresh onion and garlic though as I didn’t have powder, and went a bit mad on the nutritional yeast too). My latest batch is just sitting out and I’m hoping they will go a bit tougher. I used your recipe as inspiration for a dish last night. I scaled down to one serving and substituted finely minced roasted cauliflower for half of the mashed potato (I needed to use up that darn cauliflower!). I also threw in some “bacon” garbanzo beans (made using Have Cake, Will Travel’s recipe), which added really nice flavor – next time I’ll use this again and leave out the dried thyme (though if I have fresh thyme, I’ll use that which I much prefer). I lightly steamed the kale in a stir fry I was making and finely cut before adding to the mix – no problems with excess moisture, in fact I had to add more almond milk than the recipe requires. Then, to top off my adulteration of your recipe, I baked the whole thing in a ramekin for 20 minutes because I didn’t have time to form the balls or wait for them to bake 40 minutes. It was good! I’ll make again, but next time definitely try to make these in balls. Thanks for your website and for sharing your creative recipes! I made these tonight for myself and my 7 month old son. They are fantastic! I cut the salt in half to make it baby friendly and it was perfectly seasoned. Thanks for the great recipe! I made these to bring to St. Patty’s Day party. I wasn’t expecting much because I’m not a big colcannon fan, even though I love kale and potatoes. These are so good they might not make it to the party. I read the reviews first and did not add the water because the kale was pretty wet already. 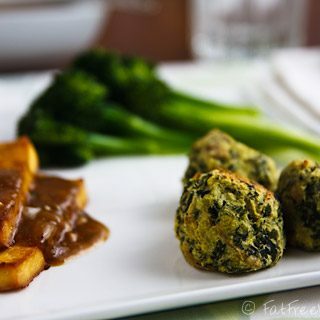 I will definitely make these for dinner soon! So, I know this recipe is a few years old, but I have to tell you that this is the one and only way that my daughter will eat kale. I made it first a year ago for St Patricks Day dinner and I was totally amazed to see my daughter gobble them up. So I tried again this year, and as I mixed up the potatoes and kale I was sure that she wouldn’t go near them this year. Wrong again! What a treasure– kale my daughter will eat! I just made these and was very hopeful because they looked so good! I used Yukon Golds as well and I think they were maybe too soft? I followed the recipe exactly and 2 tsp of salt is WAY too much. Other than that I think I will make them again and use different potatoes and much less salt. Thank you for the recipe! I wanted to make a “veganized” version of Albondigas soup for dinner tonight and thought these would be a good alternative to the typical “meat ball”. Do you think they would hold together like a meatball or fall apart in the soup? I think they would get soggy, but I’m not sure if they would fall apart. I’ve just discovered your blog and really love your style of cooking. I love how light you make these “puffs.” Thank you! No baking soda or powder to add “puffiness”? I made these tonight and the whole family loved them. After cooking the kale, I put it in a paper towel and squeezed out the water. The consistency was perfect. Thank you for all the great recipes! Yum! 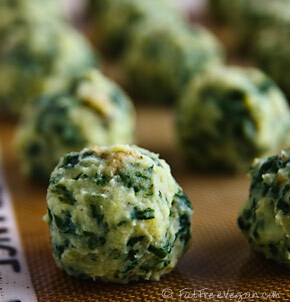 I am definitely making these for my kale and potato loving kids! I am not a vegan and do not know what “nutritional yeast” is. Can you explain? Your bean & cabbage soup sounds interesting,Ill try it. So does your colconnan puffs.from another Irish lass in MT..
Love this recipe! Do you think it could be made in a pie dish instead of as little individual pieces? Any idea on how to adjust the recipe for that? Thanks! I just discovered this recipe for St. Patrick’s and it is so easy. 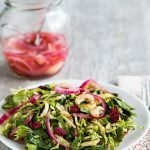 I have been looking for a recipe to do mindless eating when I am reading and this fits the bill as a nibblie that is guilt free! Thank You very much YUM! Wow, made these tonight for dinner. They were delicious! I ate a good chunk of them all by myself. Next time, I will use less salt but will definitely make them again! Thanks for sharing the recipe. These look good but can I make this without soy milk? My husband is allergic to soy. Any kind of non-dairy milk will do. Cut the salt to 1tsp. and this recipe still rocks! Don’t worry if the puffs don’t allow you to turn them a full 180°, they still come out crispy. I made these today and they turned out great. Reading the comments, I omitted the extra water. I also used frozen chopped spinach that was thawed and squeezed dry. I added a dash of dry mustard and a squeeze of fresh lemon. They were awesome. Thanks for another great recipe. Thank you for sharing all of the lovely recipes you post It is truly a god send.